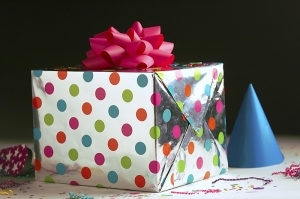 Tips, gifts and games for the ultimate birthday bash. Why not get creative on your little one’s next birthday? With Color-a-Cookie™, kids can create cookies all their own with coloring book cookies and cookie baskets. The kit comes with three edible markers for decorating and features really cool characters from Sesame Street, Sponge Bob, Dora, Care Bears, Scooby Doo, Shrek, Batman and Madagascar. Use this great activity as a birthday party theme, delicious gift or for fabulous party favors. To cook up a delicious birthday bash, visit www.coloracookie.com. Actor and author John Lithgow saves us from the ordinary themed birthday parties with his newly released Lithgow Party Paloozas: 52 Unexpected Ways to Make a Birthday, Holiday, or Any Day a Celebration for Kids (Fireside Books). With cool new themes such as opening day, dictionary day, the deep blue sea and more, there’s always a palooza to be had. Each theme idea lists the instructions, supplies needed, approximate time, cost and age range for hosting the most appropriate party. To steer clear from ordinary birthday parties, visit your local bookstore. Every birthday is a special one for your child, which is why Disney has created a way to commemorate the special occasion. New Disney Ball® Jar Art™ kits allow parents to create a 3-D scrapbook decorated with their child’s favorite Disney characters. Designs include princess characters, Mickey and friends and characters from Finding Nemo. Fill the jar with shells if kids love the sea, crayons if they love to draw or maybe just their favorite candy. All projects can be done in under 30 minutes and are great for gifts and birthday activities. Disney Ball Jar Art is available at retailers nationwide, and can be ordered by calling (877)JAR-ART-1. Most kids can’t hardly wait for their big birthday to arrive. Little Zephyr is no exception— she can’t wait for her birthday to arrive in the book Stop This Birthday! (Chronicle Books) by Rowan Cutler. When Zephyr’s birthday arrives, she wishes it could be her birthday everyday... and boy does she get her wish. This comical tale teaches why things are special because they come once a year and how to calm impatient children. With whimsical illustrations and a hilarious storyline, this book is great for any birthday boy or girl. Available at www.amazon.com. Party Favors, Balloons and Cakes... Oh My! Planning your child’s birthday party can become overwhelming quickly. From getting the balloons to finding the right cake, there’s a good chance you’ll feel frazzled. Kaboose has re-launched its online Birthday in Box™ event planner. This is the perfect way to personalize your child’s party with over 70 themes to choose from for kids ages 1-14. Numerous party packages that include themes, decorations, party favors, games and jokes are available for the entire party to enjoy. To access tips on how your child can get involved in the planning process, as well as to make your planning a bit easier, visit www.birthdayinbox.com. For birthday party activities you’ve never seen before, check out Post-It® Kids Parties (Fireside Books). A whacky way to use your imagination and Post-Its together, the book allows you to create invitations, party games and gift-tags. These compact and colorful kits don’t require glue or scissors, making it a great activity for younger ones. Each book comes with a starter kit to help along first timers. To join the fun, order your copy at www.amazon.com. Nothing is more exciting than a baby’s first birthday. That is why everything needs to be perfect, including invitations and announcements. Socially Yours has just joined up with famous photographer Linda Hamilton— known for her black and white photos with spot color— to release a new line of stationery called the Linda Hamilton Collection. With three specific invitations, imprintables and note cards appropriate for birth announcements and first birthdays, this stationery adds a touch of class to any occasion. Ordering information for the Linda Hamilton Collection is available at www.sociallyyours.com. •2 ounces white baking bars (white chocolate), from 6 ounce package, melted. •Heat oven to 350°. Stir sugar, vanilla and eggs into large bowl, then add flower and baking soda (dough will stiffen). •Pat dough in an ungreased 12-inch pizza pan. Cook for 15 minutes or until golden brown; cool for 30 minutes. •Make Chocolate Pizza Sauce by heating one cup of semisweet chocolate chips with two tablespoons of butter, three tablespoons of milk and one cup of powdered sugar. •Spread over baked cake and sprinkle with desired toppings. Makes 16 servings. Having a spectacular birthday party means more than just buying balloons, party favors and presents. Well, presents usually fare pretty well, but kids also crave fun, interactive entertainment. The Web site www.amazingmoms.com gives you plenty of great suggestions for games and activities. With games like Buzz Bomb Balloon, Poor Kitty and A.B.C. Ship, the party is sure to be a hit. The game Back to Back Pop is just a taste of what games the site has to offer. To play, purchase a supply of balloons and put kids in pairs of two. Kids should put the balloon in between them and face back to back. Then, on the leader’s signal, they have to be the first to pop their balloon. Play until all balloons pop to keep everyone involved.